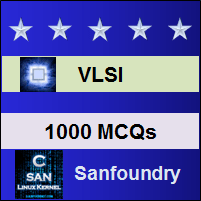 This set of VLSI Multiple Choice Questions & Answers (MCQs) focuses on “Design for Testability”. c)	Many chips are required to be tested within short interval of time which yields timely delivery for the customers. Explanation: Design for testability is considered in production for chips because many chips are required to be tested within short interval of time which yields timely delivery for the customers. a)	Detect faults in fabrication. Explanation: The functions performed during chip testing are detecting faults in fabrication and design failures in functionality. Explanation: ATPG is Automatic Test Pattern Generator. Explanation: Delay fault is considered as logical fault. Explanation: A metallic blob present between drain and the ground of the n-MOSFET inverter acts as Physical defect, Logical fault as output is stuck on 0, Electrical fault as resistor short. Explanation: High resistance short present between drain and ground of n-MOSFET inverter acts as Pull up delay error. Explanation: The dimensions of the gate is less than the distance between source and drain. Explanation: Controllability is defined as the ease with which the controller establish specific signal value at each node by setting input values. Explanation: Observability is defined as the ease with which the controller determines signal value at any node by setting input values. Explanation: The circuit is said to be low on Testability if large number of input vectors are used to set a particular node (1) or (0), to propagate an error at the node to output. Explanation: Divide and Conquer approach to large and complex circuits for testing is found in partition and Mux technique.